My middle child, Anthony attends St. Gregory's University in Shawnee, Oklahoma. 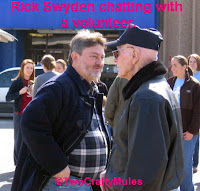 Each Sunday afternoon, he heads over to Oklahoma City and does volunteer work for Hotdogs for the Homeless. My daughter, Brianna and I visited Anthony this past weekend and also had the opportunity of volunteering for this very worthwhile cause during our visit. Hotdogs for the Homeless was started by a man named Rick Swyden 6 years ago. What began as a loving gesture to feed one hungry, homeless man on the street has evolved into Rick and his volunteers providing 300 hotdog lunches to the homeless in Oklahoma City every Sunday. To date, Rick's group has served nearly 85,000 lunches since the program began in 2003. At 12:00 noon, the volunteers meet inside of a large vacant room in a strip mall. 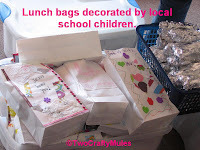 Here, they boil two tamale pots full of hotdogs, place them on buns, wrap them in foil and assemble bagged lunches in white paper bags which have been decorated by local school children. Each lunch consists of a hotdog, snacks, napkins, condiments and bottled water. Extra hotdogs are wrapped for those who would like seconds. By 1:00 p.m., once everything has been prepared and assembled, the lunches are put into large plastic storage boxes and placed into the backs of the volunteers' vehicles. They then drive out to three designated stops within the poor sections of the Oklahoma City streets to hand out the lunches. The homeless are gathered at each stop. This is not only an opportunity for the homeless to eat a meal, but to talk with others, share stories and human companionship which is so often lacking in this situation. Rick often gives hugs away with the lunches; he has befriended many of these homeless people and has helped at least 30 of them get off of the streets and into homes and jobs. The spirit of giving is contagious. Many of the volunteers add their own bit of love into the mix. One regular volunteer bakes cookies each weekend and gives them out at the stops. Others bring gently used clothing, new scarves and backpacks to share during this time. Honestly, I'm not sure who enjoyed this time more - the homeless people or the volunteers - but in any case, it is a heartwarming experience for all concerned. In our current economic situation, it's nice to know that even the smallest gestures of kindness can evolve into such an amazing and touching event. CBS Evening News ran a touching story on Hotdogs for the Homeless in 2007. 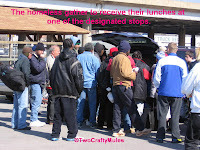 Please be sure to check it out on the Hotdogs for the Homeless website. Also, if you would like to donate to this worthwhile organization, you can find out the details through their website. 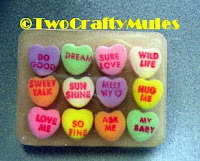 Just in time for Valentine's Day, this funky and fun belt buckle features real Conversation Heart candies. It is made from resin so it is durable and will last for many years to come. 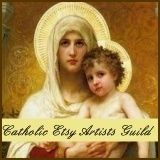 It is available for purchase on Etsy and EBay. This is definitely one of my favorite creations to date.